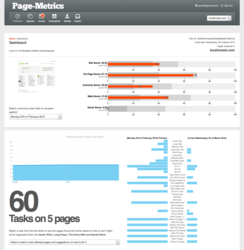 London based Page Metrics have released an easy to use SEO tool for small and medium businesses to accelerate their performance in search engine results. A London based technology company they have released an easy to use SEO tool for small and medium businesses to accelerate their performance in search engine results. This automated web analysis application solves 4 universal challenges facing many small business websites. What are the important SEO elements to check? How do I check all of these across every page of my site? How do I prioritise them? What’s the best way to put them right? Using a proven model to test a website for SEO performance, automated site crawling and analysis that can check thousands of pages, a prioritised task list and unbiased hints and tips to fix problems found Page Metrics solves all 4. By taking the best of new technology Page Metrics has created a scalable, reliable and fast solution. Using Amazon EC2 and noSQL database CouchDB Page Metrics allows small businesses to leverage big data technology to solve practical business challenges. The dashboard is simple, easy to use and quick. Giving a score for key site elements and identifying where potential roadblocks to success are. Page Metrics quickly identifies duplicate title tags, pages with little relevant content, missing image alternate tags and so much more. The analysis doesn’t stop at on-page factors; Page Metrics collects data on site authority and links, identifying pages with little or no external authority, a major factor in ranking. Social media isn’t forgotten, with details of how many times a site has been shared on all of the major social media sites. If this wasn’t clever enough the Page Metrics team have gone a step further and prioritised all of the findings into 4 categories; quick wins, long plays, the extra mile and social rank. Making it really simple for website owners to see where they should start and what to focus on. All of this information is also available to download as a spreadsheet. Page Metrics doesn’t stop there, with useful tips and signposts to trusted information on how to put each element right, including videos built into the dashboard to ensure you can quickly see why something is important and how to put it right. You can then track your changes over time comparing against previous site crawls. As search engines provide the majority of traffic it just makes sense that small businesses should make the most of big data technology and automation to find that competitive edge. Page Metrics is a brand of E2 SEO Technology Ltd, based in East London's Silicon Roundabout and a pioneer in utilizing big data technology to solve SEO challenges at an affordable cost. Founded by an SEO veteran who has years of experience working with some of the world’s biggest brands.